St John’s College is the Theological College in Auckland where Ministers in the Anglican and Methodist Churches of New Zealand and Polynesia train. The library is central to teaching within the College and to the wider church community, being the largest theological library in New Zealand. The library building is situated adjacent to historic buildings. In parallel with a project to refurbish the library building the Trust Board engaged Boffa Miskell to address site design. A new path which would enhance the library entrance was sought. In addition courtyard spaces that staff, students and visitors could use while on site or visiting the library were to be designed. The site has a northerly aspect and slopes down to the library. The existing entry was overgrown by mature shrubs which enclosed the entry and obscured the historic buildings and the view down to the library. Our design successfully creates two contemplative courtyard spaces set within the College grounds. The courtyards utilize small retaining walls to provide flat paved areas with seating. The new pathway is welcoming and informal. It respects the historic character of the College, while welcoming users to the modern library. The entry path now has a connection into the carpark with steps, a pedestrian road crossing and lighting. 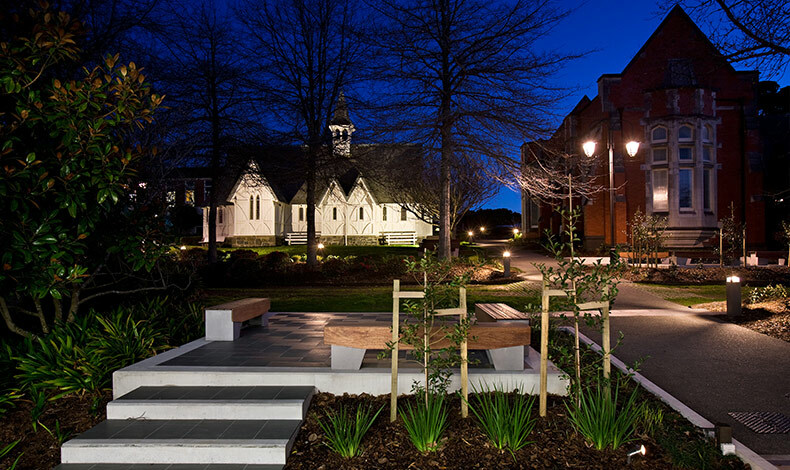 The design reflects the materiality of the refurbished library building, while respecting the historic character of the surrounding buildings.